David J. Toscano (b. June 28, 1950, in Syracuse, New York) is a Democratic politician and lawyer. Toscano served on the City Council from 1990–2002 and as mayor from 1994–96. In November 2005 he was elected to the Virginia House of Delegates, replacing Mitchell Van Yahres. He currently represents the 57th House District. As of April 2019, Toscano has run in 7 races for public office, winning 7 of them and raised a total of $2,467,009 in elections. Toscano once chaired the 14-person Emergency Medical Services committee. ↑ Web. 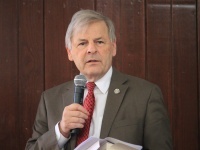 Toscano Elected New House Minority Leader, David Toscano, retrieved November 22, 2011. ↑ Web. Virginia State Board of Elections Elections Database, Elections Database, Virginia State Board of Elections, retrieved April 17, 2017. ↑ Web. House Democrats regroup, elect Toscano leader, Wesley Hester, Richmond Times-Dispatch, November 20, 2011, retrieved April 17, 2017. ↑ Web. Virginia House of Delegates Candidates Showcase, Charlottesville Podcasting Network, August 12, 2009, retrieved April 17, 2017.